This year at Chaos Communications Congress (28C3) Ang Cui presents Print Me If You Dare, in which he explained how he reverse-engineered the firmware-update process for HPs hundreds of millions of printers and In Andrei Costin’s presentation “Hacking MFPs” he covered the history of printer and copier hacks from the 1960s to today. 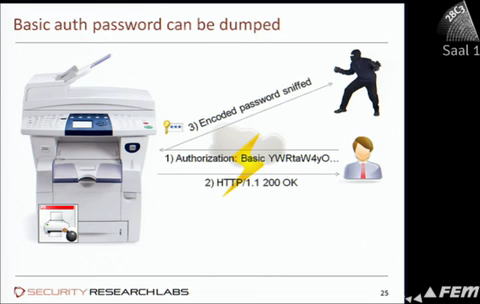 Cui discovered that he could load arbitrary software into any printer by embedding it in a malicious document or by connecting to the printer online. As part of his presentation, he performed two demonstrations: in the first, he sent a document to a printer that contained a malicious version of the OS that caused it to copy the documents it printed and post them to an IP address on the Internet; in the second, he took over a remote printer with a malicious document, caused that printer to scan the LAN for vulnerable PCs, compromise a PC, and turn it into a proxy that gave him access through the firewall. Costin found a method to exploit the firmware update capability of certain Xerox MFPs to upload his crafted PostScript code. He was able to run code to dump memory from the printer. This could allow an attacker to grab passwords for the administration interface or access or print PIN-protected documents. MFPs are trusted devices connected to the office network, but sometimes they’re also accessible from the Internet. The numbers of publicly accessible office MFPs range in the tens of thousands. An attacker could craft PostScript code tied with exploits from the Metasploit framework and upload it to an MFP to attack a corporate network. Cui’s technique for infecting printers involves the more limited Printer Job Language, rather than PostScript, and injects code into processes running on the printer. This was effectively a custom rootkit for the printer’s OS. Cui gave HP a month to issue patches for the vulnerabilities he discovered, and HP now has new firmware available that fixes this (his initial disclosure was misreported in the press as making printers vulnerable to being overheated and turning into "flaming death bombs" he showed a lightly singed sheet of paper that represented the closest he could come to this claim). He urges anyone with an HP printer to apply the latest patch, because malware could be crafted to take over your printer and then falsely report that it has accepted the patch while discarding it. The vulnerability was disclosed to HP, and updates for infected printers were released last week.